Not only does this novel glitter with sharp ideas and observations, it may just be the best book I’ve ever read about Paris. 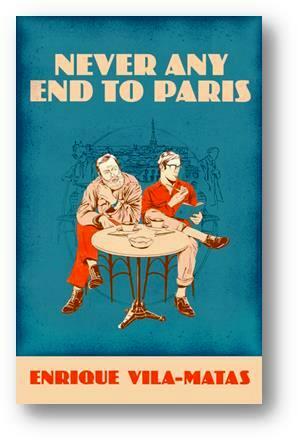 First published in Spanish in 2003, Never Any End to Paris by the Barcelona-born Enrique Vila-Matas is only the third of his works to appear in English. Skilfully translated by Anne McClean, it is a curious artefact, inhabiting the shadowy domain at the intersection of fiction and memoir. 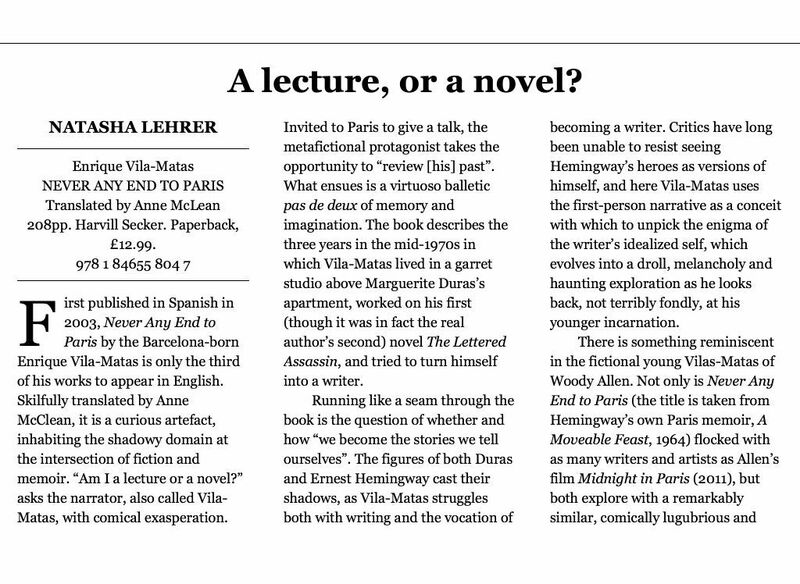 “Am I a lecture or a novel?” asks the narrator, also called Vila-Matas, with comical exasperation. Invited to Paris to give a talk, the metafictional protagonist takes the opportunity to “review [his] past”. What ensues is a virtuoso balletic pas de deux of memory and imagination. The book describes the three years in the mid-1970s in which Vila-Matas lived in a garret studio above Marguerite Duras’s apartment, worked on his first (though it was in fact the real author’s second) novel The Lettered Assassin, and tried to turn himself into a writer. Running like a seam through the book is the question of whether and how “we become the stories we tell ourselves”. The figures of both Duras and Ernest Hemingway cast their shadows, as Vila-Matas struggles both with writing and the vocation of becoming a writer. Critics have long been unable to resist seeing Hemingway’s heroes as versions of himself, and here Vila-Matas uses the first-person narrative as a conceit with which to unpick the enigma of the writer’s idealized self, which evolves into a droll, melancholy and haunting exploration as he looks back, not terribly fondly, at his younger incarnation. For all the endearing humour, Vila-Matas has a serious purpose: to uncover truth where perhaps only reality is visible (in a recent interview he said that he believes “that fiction is the only thing that brings me closer to the truth that reality obscures”). He is in awe of those who succeed in translating their versions of truth to the page, and here he charts his own attempts to peel away the membrane of reality: “Where there is a mirage there is life”. Not only does this novel glitter with sharp ideas and observations, it may just be the best book I’ve ever read about Paris.